Ribbon cutting ceremony of the newly constructed “Shops at University Park” on Saturday, Apr. 14. Four new businesses occupy the center – Dickey’s BBQ, Jamba Juice, Wayback Burgers and Jimmy John’s. Phase 2 of the development will break ground shortly and will accommodate six new businesses – VCA Animal Hospital, Poki Nation, Asian Fusion, Fire Wings, Coffee & Tea, and Afters Ice Cream. On Saturday, April 14th, the JR Watson & Associates Development Corporation and the San Bernardino Chamber of Commerce held a grand opening and ribbon cutting ceremony of the first phase of the “Shops at University Park.” The ceremony took place at the outdoor seating area of the complex that faces Cal State San Bernardino (CSUSB) overlooking a newly developed University Plaza area. The new complex is located on the southwest corner of North Park Boulevard and University Parkway. These new shops will serve the university and surrounding communities. University Plaza is owned by the CSUSB, but many of the improvements were funded by JR Watson. The plaza includes a new performing stage, landscaping, shade structures, seating area, lighting, and a special water fountain. 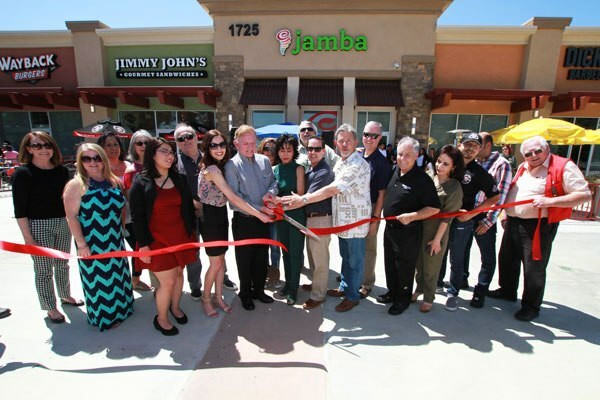 The completion of this first phase of the development included several new businesses in San Bernardino: Dicky’s BBQ Restaurant, Jamba Juice, Jimmy Johns Gourmet Sandwiches, and Wayback Burgers. During the grand opening statements Chamber President Judi Penman announced that “the best is yet to come,” In a few weeks, the developers will be conducting a ground-breaking ceremony for a new building that will house six new businesses in San Bernardino. The new businesses are VCA Animal Hospital, Poki Nation, Asian Fusion, Fire Wings, Coffee & Tea, and Afters Ice Cream. According to developer and owner Jim Watson, businesses should be opening by September of this year. 5th Ward Councilman Henry Nickel presented a Certificate of Welcome and Best Wishes from the Mayor and all city councilmembers. Representatives from Assemblyman Marc Steinorth and State Senator Mike Morrell also awarded certificates of appreciation. The Cajon High School Jazz Band played during the ceremony and were the first to play live on the new stage. Fernando Dutra, builder and land developer unveiled a fountain sculpture created by the late Richard Johnson who was a Professor of Arts at the university. The plaza on which the sculpture stands will soon be a gathering place for many residents and students. According to Fernando, Lost West Landscape Architects and Land Scape Contractor Service Scapes played important roles in developing this new plaza. Many of the vendors offered free food samples, and some held raffles and giveaways. Akram and Manak Chahine are the new owners of Wayback Burgers, and this is their first restaurant. They are looking forward to serving the community. Paolo Tovar is the new owner of Jimmy John’s restaurant in San Bernardino and is also the owner of the Jimmy John’s restaurant in Fontana. Paolo’s commitment to the community was demonstrated back in 2016 during the Blue Cut Fire that forced the community of Lytle Creek out of their homes and into a Red Cross Shelter in Fontana. Paolo visited the shelter and immediately saw a need and provided meals for displaced clients and Red Cross shelter workers. 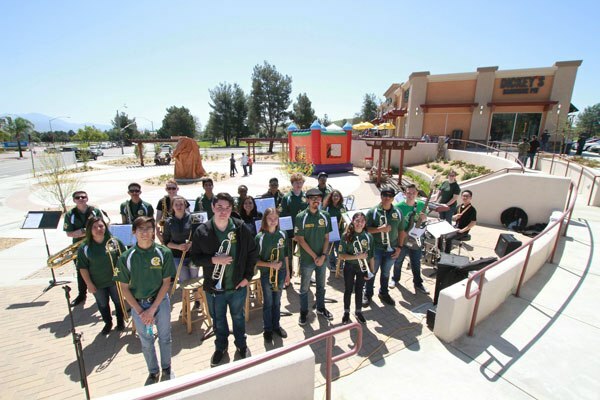 The Cajon High School Jazz Band played during the ceremony and were the first to play live on the new stage.